Cladding panels from Rodeca feature on the redeveloped Sacred Heart School. Translucent cladding from Rodeca has breathed new life and light into a school redevelopment. More than 700m2 of the manufacturer’s polycarbonate panels have been used on two new buildings which form the new Sacred Heart School, a mixed Roman Catholic voluntary-aided comprehensive school with more than 600 pupils, in Camberwell, London. In the sports and assembly halls, where the Rodeca panels have been used as a clerestory feature, and in two lightwells in the new teaching block, they form a double-wall construction of 40mm PC2540 wall panels in Kristall finish. 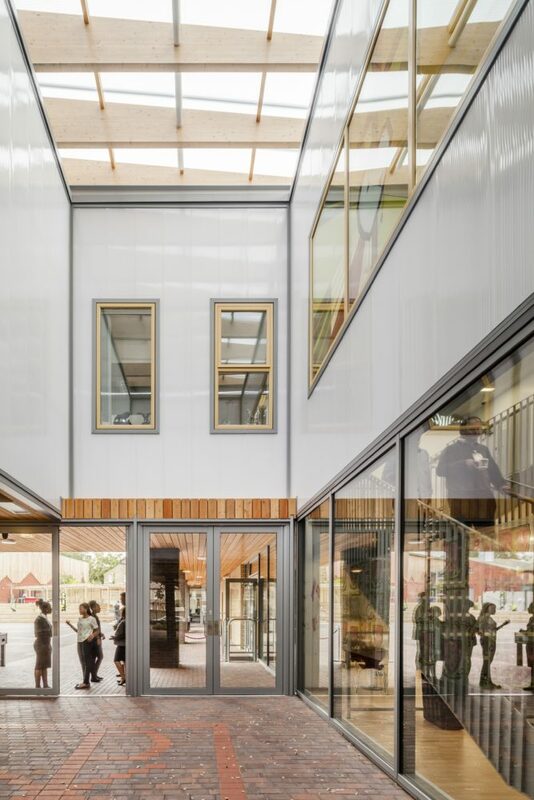 The same panels also form a double-wall construction to a clock-faced lightbox on top of the teaching block which acts as a lantern when lit at night, providing a community focal point of reference. And they have also been used in an activity studio and “chimney” feature. In addition, an entrance courtyard is clad with 60mm PC2560 Rodeca wall panels in Opal finish on all sides at first floor level, while 25mm PC2625 wall panels in Kristall finish form an outside canopy. The entire school, a specialist mathematics, ICT and language college, had to be decamped while the 9,200m2 site was remodelled by main contractor Balfour Beatty to provide new and larger accommodation and increased form of entry. It lies within a Conservation Area and alongside a parish church which the students regularly use. Regular Rodeca specifiers Cottrell & Vermeulen Architecture designed the two new buildings to replace the existing school buildings which date back to 1959. Ranging from single to three stories, these were clad in metal and glass with some areas of brick stock. The new buildings comprise a two to four-storey teaching building clad mainly in brick but with the Rodeca panels as features and a steel-frame sports block also clad mainly in brick but with timber features as well as the Rodeca panels. Cottrell & Vermeulen architect Paul Taylor said: “We specified Rodeca as it acts as a counterpoint to the overriding mass of the brickwork, providing uniformity of lightness that can be provided in large areas. Part of the Southwark BSF (Building Schools for the Future) programme, a £200million scheme to transform secondary education in the London borough, the Sacred Heart project lay dormant for two years while another Southwark BSF project was built nearby in Elephant & Castle where Sacred Heart was temporarily housed while its own site was redeveloped. The redevelopment was based on a strategy of simple, integrated structure and services and incorporates a number of measures to minimise its energy and water use and ensure it provides a sustainable resource for the local community. The energy strategy was adopted to meet the Mayor of London’s aspiration for a reduction in carbon emissions to being lean (energy efficient measures), green (renewable technologies) and clean.